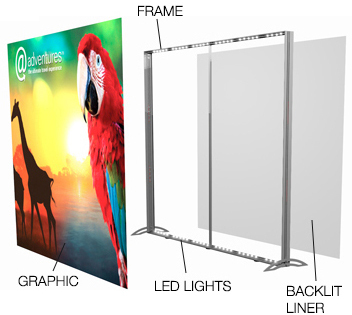 [caption id="attachment_423" align="aligncenter" width="660"] Enlighten Series of Backlit Displays Range from 20' Inline to 5' Tabletop[/caption] Need a backlit graphic on the wall? Enlighten can also easily be mounted to the wall. [caption id="attachment_424" align="alignnone" width="352"] Enlighten Backlit Graphic, Frame, LED Lights, and Liner[/caption] New Backlit Extrusion Enlighten features our newest extrusion. It is designed to provide you with a backlit solution that is lightweight and easy to install. SEG Graphics SEG graphics are always custom tailored for fit and finish. The TriFab fabric on Enlighten is wrinkle resistant, durable and machine washable. Enlighten can provide a double sided solution, too. It’s as easy as connecting two frames back-to-back. Brilliant LED Lighting Energy saving LED lights are a bright white (5500 kelvin) and last up to 50,000 hours. Easy Assembly Lights are pre-installed into the extrusion channel for optimal protection. Frame sections glide together and only require tightening with thumb screws. All that is left is to connect the light modules between frame sections, mount the side base plates, install the SEG graphic panel, turn on the lights and you are ready to light up the show. All of it can be installed in under an hour. Lights are attached to the backlit extrusion channel with Dual Lock™ to make them easily replaceable in the field. Shop EXHIB-IT! 's Enlighten Series All-in-One Case Backlit Displays catalog now. For additional pricing information, to get a quote, or to schedule an appointment, contact us today.